Quick homemade taco seasoning loaded with chili powder, paprika, cumin, garlic powder, and oregano. 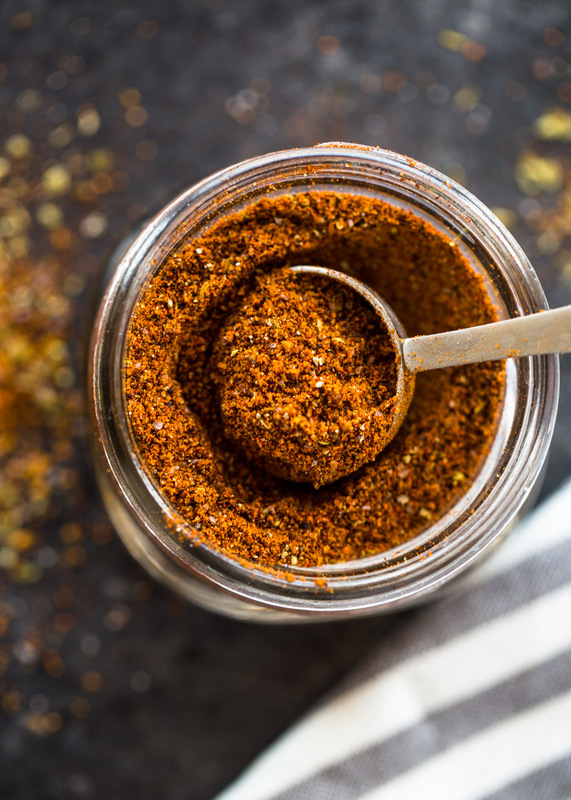 This perfectly balanced taco seasoning mix makes the BEST seasoning for tacos, burritos, chicken, and much more! Taco Tuesdays just got a whole lot better! 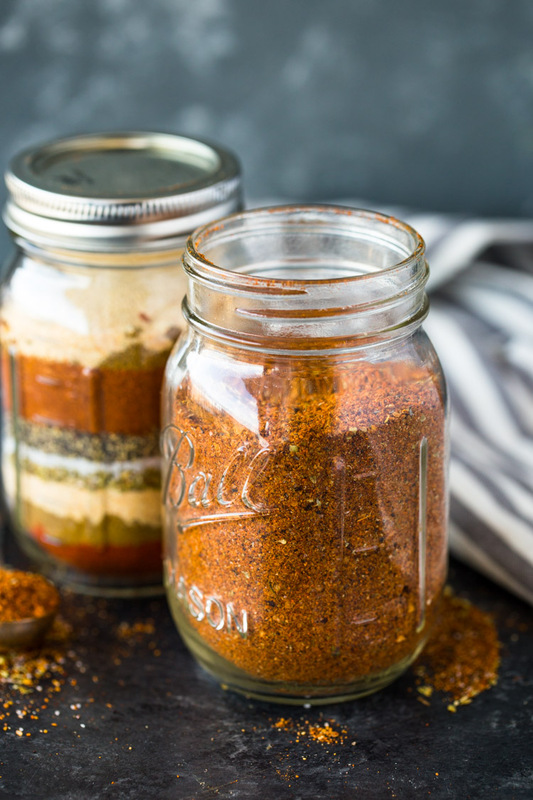 Homemade taco seasoning is a MUST in my pantry. I used to go through packs of taco seasoning every week but why use the packaged stuff when you can make your own? Don’t get me wrong, store-bought taco packets are very convenient and taste so good but are loaded with a whole bunch of fillers and ingredients we can’t even pronounce. This quick DIY homemade version tastes even better and will save you a lot of time and money. You can mix a big batch and store it in a large mason jar or just mix a 2 tablespoon version to make the equivalent of one taco mix packet. Add all the spices to a mason jar. Cover tightly and shake! Enjoy on chicken, shrimp, or beef! Tip: 2 tablespoons of taco seasoning is equivalent to 1 packet of store-bought taco seasoning. 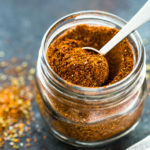 Quick homemade taco seasoning makes 1 packet or a large batch. 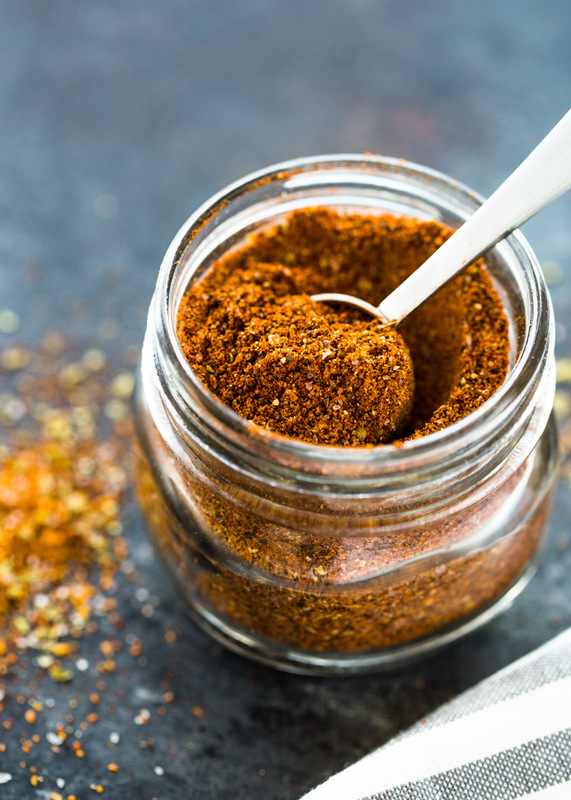 This perfectly balanced taco seasoning mix makes the BEST seasoning for tacos, burritos, chicken, and much more! About 2 tablespoons of taco seasoning are equivalent o 1 taco packet. To make enough for 1 packet, reduce the serving size to 1 serving via the button above. I make something similar. Here are my changes: no salt, 2 tsp of smoked paprika, 1.5 Tbsp cumin, 1 tsp chili flakes, extra minced onion (cause I love it). I haven’t used flour or CORNSTARCH so that will Be a new experience. I also only use a tbsp per pound of meat, u find that It is more than adequate. Cause after adding salsa, hot sauce, etc, 2 tbsp would be too much spice. Necessity is the mother of good recipes! Thank goodness for this recipe! We had our Tastebuds set on taco salad & had no seasoning. I found this recipe & it saved the day even without the mInced onions (that i didnt have!). Delicious! No more store bought!! Thanks So much!! Also, i use 2 lbs of ground turkey meat so should i use 4 TABLESPOONS of mixture? I just made this but the color of yours and mine are different. Yours is more red and mine is more brown. i checked the ingredients and i put in the correct amounts. I’ve noticed that chili powder can range in color… maybe it had some to do with using a different brand of chili powder. what PROPORTIONS do you need for a small mason jar? Hi, how long can we keep this refrigerated? In my Teen children’s words, this was LEGIT! I used smoked paprika for a little twist. I might use chipotle seasoning next time and see what happens. Very GOOD. used not quite a full tablespoon of salt. i TRIEd this because I Was out Of the packets and had everything else ready. I’m glad I was out. This had a better flavor than the premade seasonings. What is the corn starch for? The cornstarch is optional but it does help the spices stick to the meat and form a nice and charred crust. It also prevents the spices from caking together if you don’t use the mixture immediately. To thicken when added to the meat. This is a great starter recipe for home made taco seasoning mix. I made it exactly as described and it is delicious. It is really easy to add spice (or delete the salt!) if you want or dried onion; i will keep a jar of thiS in the cuPbOard. Very good recipe, I didn’t have corn starch so for a thickener I added 6 tablespoons of flour and increased my usage to 4 tablespoons per pound of meat. You also have to add quite a bit more water and let it simmer on low so the four cooks but doesn’t burn on the bottom. I thought this. Recepit came up lackIng. NEeded more chili powder,garlic and onion. I have to ask; what difference does the inclusion of corn starch impose? To kick iT up a notch just add a half tbsp of Chipotle powder. I really like the idea of making my own taco seasoning. I use it in many recipes too! Some of my recipes call for a packet of taco seasoning. How much of the homemade would equal a packet? 2 T. Equals a packet of stOre-Bought taco seasoning. Surprisingly delicious! Wayyyy better than those taco SEASONING packets. I added this season to some 80-20 ground beef, and with our homemade salsa, it made the tacos the BEst i have ever had! Delicious!!!! Delicious! I eat Paleo so I added some Nutritional Yeast Flakes to add a little Cheesy flavor since I don’t eat Cheese. I also cut the chili powder in half since I have kids. My daughter helped me make it. It’s great! To make it mild, I only used 1 Tbsp of chili powder and about 1/8 tsp of black pepper. I cut the salt in half. When i ADDEd it to the ground turkey, i also stirred in 1/2 cup water. Yummy for the whole family! Really good flavor, but i would cut salt in half. I too keep buying the packets for recipes and throwing away half the powder since i only need 1 tablespoon- found your recipe and already had everything i needed to make at home. thank you!